The council headquarters were in Carrickfergus and the council administered the town, on the north shore of Belfast Lough, and surrounding area, which extended from Greenisland in the south-west to Whitehead in the east. The borough was 32 square miles (83 km2), with a population of just over 39,000. 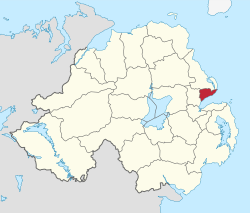 Together with the neighbouring district of Larne and small parts of Newtownabbey and Moyle, it forms the East Antrim constituency for elections to the Westminster Parliament and Northern Ireland Assembly. The area covered by Carrickfergus Borough Council has a population of 39,114 residents according to the 2011 Northern Ireland census. Carrickfergus Borough Council Facts for Kids. Kiddle Encyclopedia.